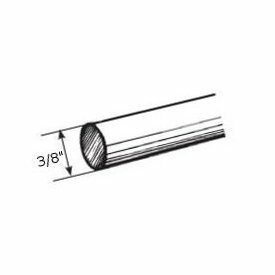 1-421-8: Decorative traverse rod set 28-48" projects 3 1/2" to 4 1/2"
Custom drapery rods for your windows. This is an assembled Cut To Measure set that includes brackets and tension device. Use for standard windows, corner windows or bay windows where you need the curtains or draperies to open and close with a traverse cord. Plus truck freight over 104". Front of Rod to Wall --select-- None 2 1/2" 3 1/2" 4 1/2" 5 1/2" 6" 7" 8"